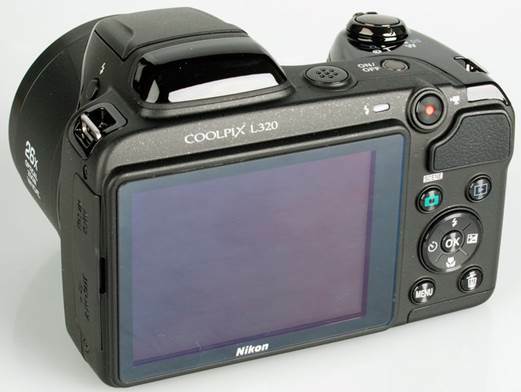 The Nikon Coolpix L320 features a 16 megapixel CCD sensor and 26x optical zoom lens, which is a 35mm equivalent of 22.5-585mm. It has lens-shift VR (vibration reduction) in order to keep images in the sharpest levels if possible. In the continuous shooting mode, it is likely to record at 1.2 fps. When shooting, there is the auto mode to be able to easily adjust the camera settings automatically for the captured subjects. In addition, there are 18 scene modes for you to choose from and clever portrait-shooting system, which includes self-timer, warning blink before shooting, skin softening and red-eye correction. Videos are recorded in the 720p HD mode. It has lens-shift VR (vibration reduction) in order to keep images in the sharpest levels if possible. 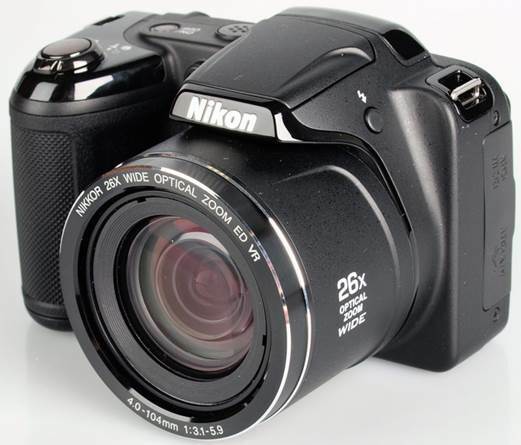 The Nikon Coolpix L320 makes the look and feel like on a small DSLR. It has the thick rubber grip and a rubber pad on the back for your thumb. 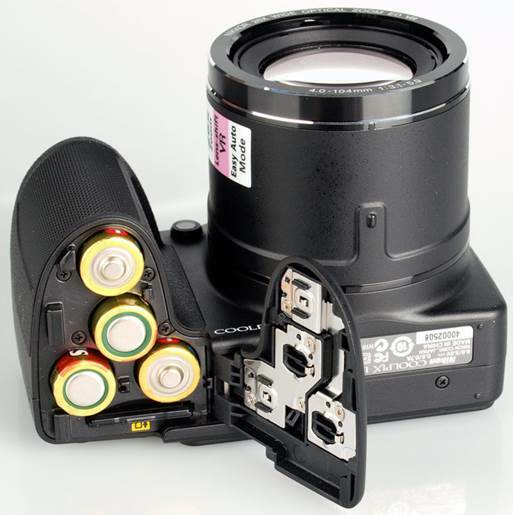 On the lens is a switch to change the focal length, you are also able to adjust the zoom by using the zoom adjusting ring. There is a button to enable the pop-up flash and an on / off button on the top of the camera. On the back side, there are the movie record, scene mode, playback, menu and delete buttons and a d-pad and OK button to cycle through the camera menus. 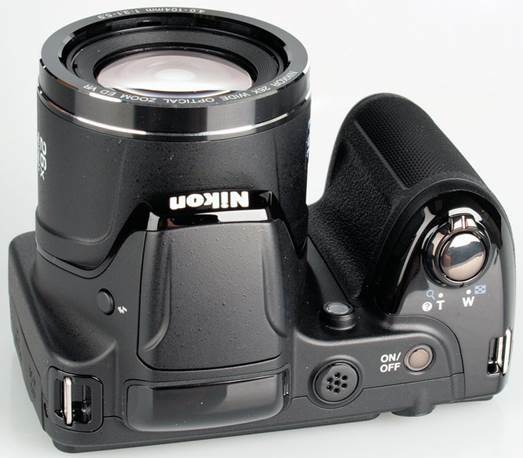 The buttons on the d-pad are able to be used to install the flash, self-timer, exposure adjustment and macro mode. You are able to view your pictures when the camera is turned off by pressing and holding the playback button. The L320 menu system is fairly easy to navigate. Almost everything is set through the menu button. The 3-inch screen is bright and clear, but has a low 230k dot resolution. Battery life is rated at 310 shooting pictures according to CIPA test results when using alkaline batteries, so you will have the opportunity to take one or two days of shooting prior to the next charging process, although this will depend on the quality of the batteries you buy. You can shoot 810 photos if you use lithium batteries instead. We took a number of shots to test the responsiveness of the camera, switching from the first picture, one to one, with the focusing speed etc. We took some photos and then used average to ensure that the tests are accurate and consistent, making it easy to compare with other cameras. The process of continuous video recording is at full 16 megapixel resolution, although it turns into to slow down after five shots.